Advertising in In&Out Magazine and its sister web sites is easy and effective. 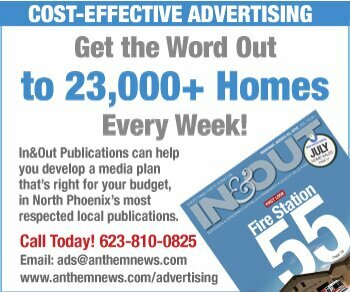 Display Ads: Email ads@AnthemNews.com or call 623-810-0825. In&Out Magazine is the most trusted sources of news & information in the area. In&Out is a weekly magazine that reaches more than 21,000 homes from Norterra to New River via US Mail, including Anthem, Arroyo Norte, Tramonto, Desert Hills, New River, Desert Hills, Carefree Crossing, Amber Hills, Sonoran Foothills, Fireside at Norterra, Valley Vista, Carefree Highlands and Dynamite Mountain Ranch. More than 2,000 copies of In&Out are also distributed through nearly 200 area businesses, including medical offices, groceries and various other retail outlets. North Phoenix News provides more information and frequent updates on the region. To learn more, email ads@AnthemNews.com or call 623-810-0825.